A group of volunteers is helping biologists see whether there are any martens left in the Olympic National Forest in Washington state. Volunteers with Adventurers and Scientists for Conservation set up motion-activated cameras in remote parts of Olympic National Forest in search of the American Marten. It's about 25 degrees on a clear Saturday morning when Gregg Treinish — executive director of Adventurers and Scientists for Conservation, a nonprofit that puts volunteers to work gathering data for scientists around the world — gathers a small group of outdoor adventurers around him near the Duckabush River in the Olympic National Forest in Washington state. The mission for this group: help biologists figure out whether there are any martens left in the Olympic National Forest. Volunteers will set up motion-activated cameras in some of the forest's snowiest, most remote territory. The citizen scientists fill their packs with a strange assortment of gear, including chicken wire, hammers, folding saws and — wait for it — human-head-sized chunks of beaver carcass. "I don't mind carrying dead things, but maybe I'll move my lunch," says Sonia Wolfman, a lawyer from Olympia, Wash., as she stuffs a black garbage bag full of beaver guts into her pack. 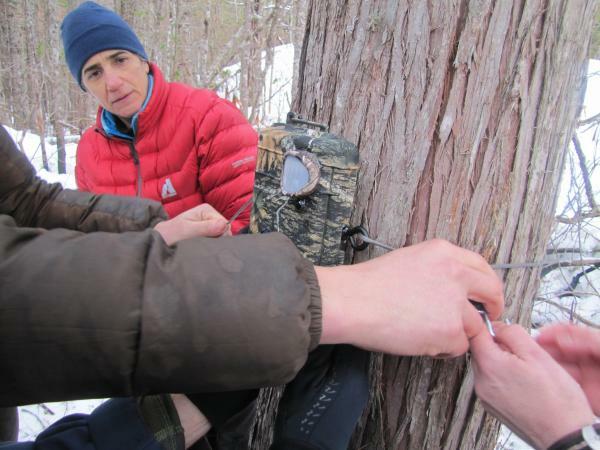 The beaver, which was provided by the Forest Service, will be used as bait to lure the martens in front of the remote cameras the volunteers plan to set up throughout the forest. But in the Olympics anyway, catching a marten, a member of the weasel family, on camera is a rare occurrence. "For the past 25 years, we've had three verifiable sightings," says Betsy Howell, a biologist with the Forest Service who helped organize this project. "Two were photographs and one was an animal caught in a trap." Although martens are doing OK in parts of the mountain West, their numbers appear to have plummeted in recent decades in the coastal ranges of Oregon and Washington. Until scientists know that for sure, these animals can't be recommended for protection under the Endangered Species Act. That's where these volunteers come in. Treinish leads the group into the woods at a brisk pace. He's a tightly muscled guy with mountain-man hair and an easy smile. When he hikes, his eyes remain glued to the forest floor, scanning the snow. He picks out the tracks of mountain lion, elk, coyote, bobcat and a host of rodents along the trail, and points them out to the group. But no sign of martens. After more than four miles of hiking up steep switchbacks and past sparkling icy rock faces, we get to a spot that looks like a place martens might hang out. To the untrained eye, it looks like every other snowy section of forest we've hiked through, but not to Treinish. "It's a nice flat area here," he explains, pointing at a dip in the landscape where a young cedar and fir tree stand about 13 feet apart. "I kind of like how it funnels everything into there, so we'll go with that spot." The group unloads its gear and starts setting up the station. Jenna Walenga, a barista from Seattle, snaps on a pair of rubber gloves and prepares to reach into the bloody garbage bag. A few years ago, she hiked Mount Kilimanjaro. Today her job is to attach a hunk of dead beaver to one of these trees. "I'm actually a vegetarian," she says, as she holds the carcass against the tree so another volunteer can nail it down beneath a layer of chicken wire. On the opposite tree, the team sets up the motion-activated camera and aims it at the beaver carcass. The chances of getting footage of martens in the Olympic National Forest are slim. Much of the old-growth forests the martens rely on in the coastal range has been cut down, and biologists worry that climate change will shrink the remaining cold alpine habitat. No one knows how many martens might still live in the national forest, but Howell says they'd probably never be able to find out without the help of volunteers like these. "We can do so much more together than we can do separately," Howell says. "The partnership is a great way to get work done that otherwise we just don't have funding or staff for anymore." The volunteers will set up 11 other stations like this one throughout the forest. Then they'll come back in smaller groups to check the cameras every month or so to see whether any martens showed up to have their pictures taken. It's still legal to trap martens in Washington and Oregon. But here in Olympic National Forest, there may not be any left to catch — on camera, or otherwise. Copyright 2013 Puget Sound Public Radio. To see more, visit http://www.kuow.org. Scientists are concerned about dropping populations of martens, a member of the weasel family, in coastal mountain ranges like Washington's Olympic National Forest. But martens can be tricky to study. These elusive animals live in the most remote parts of the forest, and they're not threatened throughout most of their range, which means they're a low priority for research funding. So as Ashley Ahearn of member station KUOW reports, some biologists are recruiting volunteers to help them learn about martens. TREINISH: All right. Do we have a folding saw? AHEARN: It's about 25 degrees on a clear Saturday morning when Gregg Treinish gathers a small group of volunteers around him. TREINISH: Do we have a hammer? AHEARN: Treinish is the executive director of Adventurers and Scientists for Conservation. It's a nonprofit that puts avid outdoors people to work gathering data for scientists around the world. TREINISH: Do we have a roll of chicken wire? AHEARN: The mission for this group, help biologists in the Olympic National Forest figure out if there are any martens left in this coastal mountain range and see if there's a threat of extinction. Betsy Howell stands nearby. She's a biologist with the Forest Service who brought Treinish's group here to help with the research. BETSY HOWELL: We can do so much more together than we can do separately. I mean, the partnership is a great way to get work done that otherwise, you know, we just really don't have funding or staff for anymore. AHEARN: The group will be setting up motion-sensing cameras in some of the most inaccessible parts of the forest at this time of year. They're extremely cute little animals, if I may be so unscientific. Martens are smaller than your typical house cat with a long, weasely body, short legs and a bushy tail. They're usually a tawny brown with an orange throat patch. Martens make their home in old growth forest. Howell explains that in the coastal region, much of that habitat has disappeared. The chances of catching one on camera here are incredibly slim. HOWELL: For about the last 25 years, we've had three sightings. Two were photographs, and one was an animal caught in a trap. 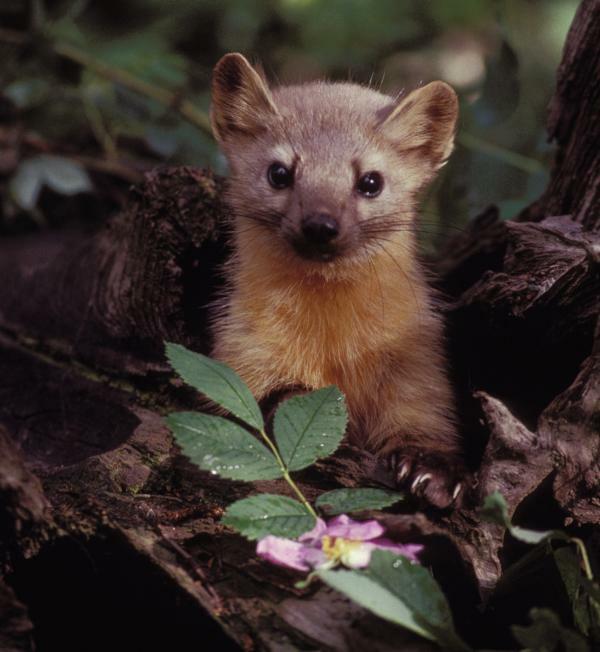 AHEARN: Martens may be rare here, but until scientists know that for sure, these animals can't be recommended for protection under the Endangered Species Act. That's where these volunteers come in. AHEARN: All right. Everyone finishes packing up, and Gregg Treinish leads the group into the woods at a brisk pace. He and Betsy Howell point out the tracks of mountain lion, elk, coyote, bobcat and a host of rodents along the snowy trail. No martens. TREINISH: Notice the track off to your left here, see if you can figure out what's using this little run here. AHEARN: The volunteers hike for several hours before they get to what looks like a good place to put a marten camera. To the untrained eye, it looks like every other snowy section of alpine forest, but not to Gregg Treinish. TREINISH: To the right of Betsy right now is a cedar tree, and then to the left of Betsy is a fir tree. I kind of like that how it funnels everything right into there, so we'll go with that spot. Sound good? AHEARN: The group unloads its gear and starts setting up the station. Jenna Walenga is a barista from Seattle. A few years ago, she hiked Kilimanjaro. Right now, her job is to pull a bloody piece of beaver carcass about the size of a soccer ball out of its plastic garbage bag and attach it to one of the trees. WALENGA: Yeah, this is a nice piece of meat. TREINISH: And really, what we're doing is we're luring them into this area so that they'll go and try to get our bait, which is really what we're hoping for so that we can get a photograph of them. AHEARN: On the opposite tree, the team sets up the motion-sensing camera and aims it at the beaver carcass. The volunteers will set up 11 other stations like this one throughout the forest. Then they'll come back in smaller groups to check the cameras every month or so to see if any martens show up to have their picture taken. And if they do, there might be a chance that they could be better protected in the future. For NPR News, I'm Ashley Ahearn in Seattle. This is ALL THINGS CONSIDERED from NPR News. Transcript provided by NPR, Copyright NPR.